The fourth conference of the series “The Appetizer” of the 2011-12 course, organized by IE School of Architecture & Design, will be held next Monday 17 October . 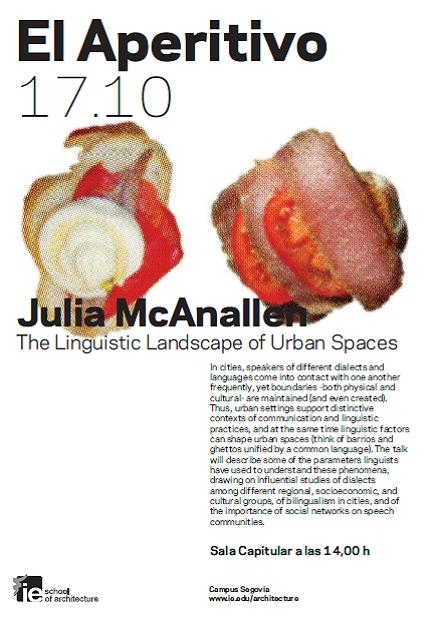 Julia McAnallen, professor at Berkeley University, will give a lecture called “The linguistic landscape of urban spaces”. The event will take place at 2pm, in Room 142 of the university´s Segovia Campus. The event will take place at 2pm, in Room 142 of the university´s Segovia Campus. In cities, speakers of different dialects and languages come into contact with one another frequently, yet boundaries-both physical and cultural-are maintained (and even created). Thus, urban settings support distinctive contexts of communication and linguistic practices, and at the same time linguistic factors can shape urban spaces (think of barrios and ghettos unified by a common language). The talk will describe some of the parameters linguists have used to understand these phenomena, drawing on influential studies of dialects among different regional, socioeconomic, and cultural groups, and of the importance of social networks on speech communities. “The Appetizer” are series that run for a second year and aim to bring students closer to the key forces that shape contemporary architecture. Recognized professionals and academics in the discipline will address specific issues that are near or tangent to the field of architecture. They will be using small presentations that are less formal and rigid than a normal conference. A total of nine lectures, thirty minutes each are scheduled until next January 2012. The panel of participating experts include Edgar González, Fermín González Blanco, Paredes-Pino, Julia McAnallen, Luis Alfaro Álvarez, José Vela Castillo, Maki Kawaguchi, Manuel PérezRomero, Isabel Collado and Ignacio Peydro. The lecture series is organized by the Associate Dean of External Relations at IE School of Architecture and executive director of the Pritzker Awards, Martha Thorne, and IE School of Architecture & Design academics, Julian Garcia and Anna Mestre.